EasyPro offers a wide selection of aquatic weed and algae control products, along with nearly four decades of experience. Controlling nuisance aquatic plants and/or algae is a problem nearly every pond owner is forced to deal with sooner or later. Aeration. Utilizing aeration will do several things. First, it maintains higher oxygen levels in the pond, particularly near the bottom. This allows organic materials to decompose rather than accumulate. 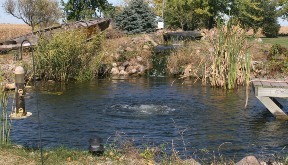 Secondly, aeration will allow natural and added bacteria to work faster at digesting the nutrients in the pond. Third, moving water is much healthier than stagnant water. Aeration will prevent stratification of the water, creating more uniform water temperatures from top to bottom. Bacteria. Adding beneficial bacteria to your pond is extremely helpful in removing excess nutrients. EasyPro Pond-Vive is used by thousands of pond owners to help control muck buildup. This muck, if left in the pond, contributes significantly to future weed and algae growth. Chemical Control. The use of safe aquatic chemicals is the most common form of treatment. Each of the products we offer is safe for humans, fish, and pets when used in accordance with the label. Be sure to read and follow all instructions on the manufacturer label. Aeration, bacteria, or chemical use alone will not usually solve the problem. Used in conjunction, however, these products are extremely effective at reducing problems and improving water quality. 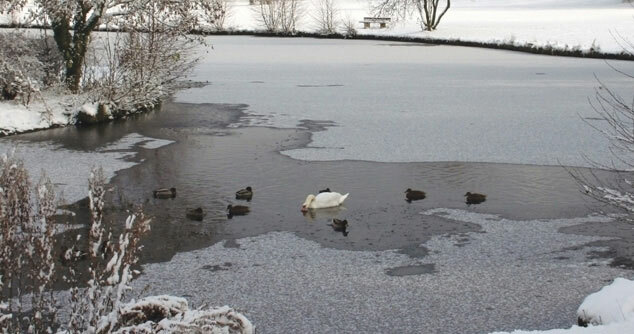 Please contact us for assistance in determining the best plan of action for your pond. Proper identification is crucial to the success of any chemical treatment. Many aquatic weeds look very similar but some require totally different products to control them. We have pictures of many popular plants in our Identify Aquatic Weeds & Algae section. If you can safely identify your weed(s) from one of these pictures, then you can select the proper treatment from our Chemical Selection Chart. If you are unsure, please contact us for assistance.